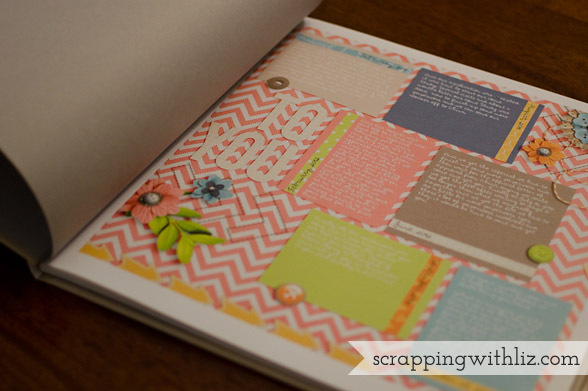 As I was uploading my digital scrapbook pages for this blog post I noticed a trend in my pages. They all contain really bright, bold patterns. 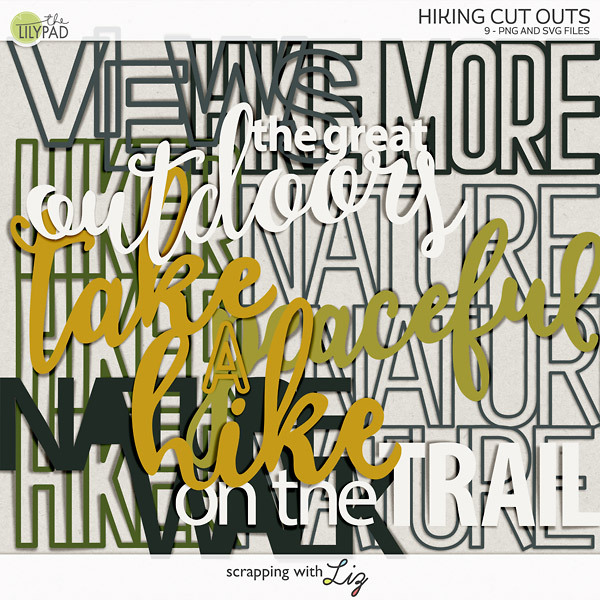 I never thought of myself as being a bright, bold pattern type of digital scrapbooker but maybe that's what I'm turning into. Or maybe it's just a phase and next month I'll go back to nice and simple. I guess we'll see. Most of the pages I'm showing you today were scrapped late July and early August. I only have five to show you today but I've actually scrapped many more. I just can't show you them yet because the templates haven't released. Let's get started. The first three pages were some last minute pages I made to add to Lydia's Album. The first page you see here is a timeline of important dates/times of her adoption process. 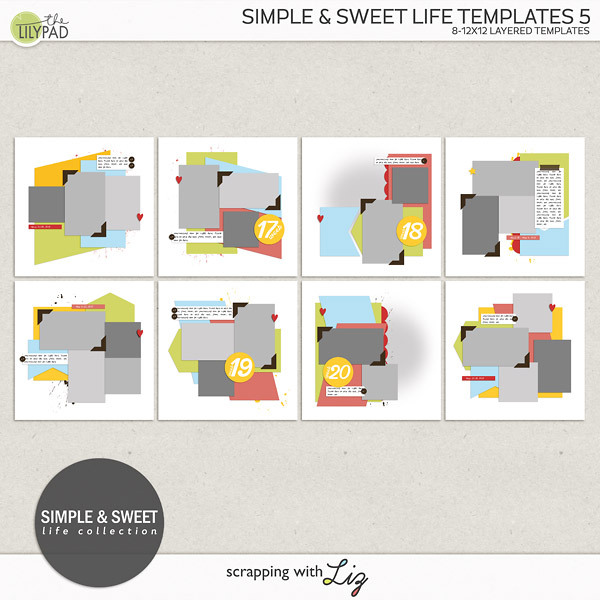 This template will be available tomorrow in a FWP deal from SO! Just a simple page of Daddy and Lydia playing in the hotel room in China. This was a template given away at my August MIS. It will be available soon in the store. The LOA (letter of approval) is one of the most important documents you get when going through a China adoption. We waited and waited and waited. We were SOOOO happy they day it finally came. I had to make a page about it. These are pics from Lydia's first time tasting cake. We had been home just a couple weeks and it was time to celebrate a cousin's birthday. This page will most likely go in her first year home album. Then here is a page with some current pictures. I scrapped during a Live Crop over at Scrap Orchard. I snapped these during one of our first weeks of schoolwork. Don't my two older girls look thrilled? I used a little sarcasm on my page. Do you see it? I can't wait to show you the rest of the pages I scrapped this month but I guess that will have to wait until next month! This front cover was made with my new release tomorrow. 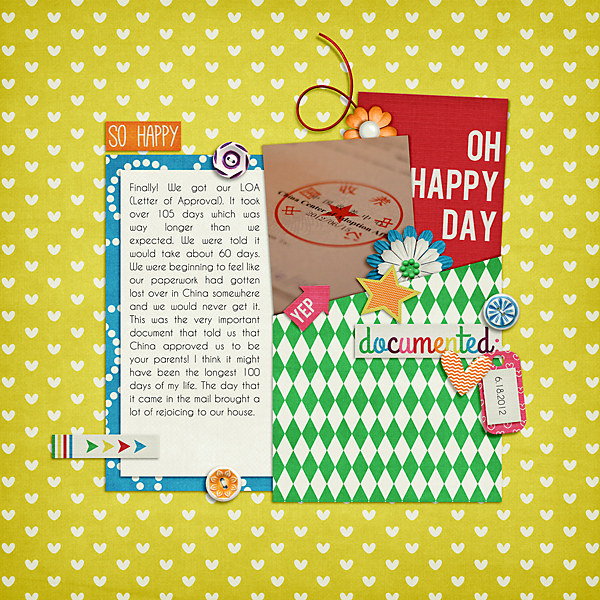 I also used Happy Travels by Tickled Pink Studio. I think I've mentioned to you all that I finished up Lydia's album. 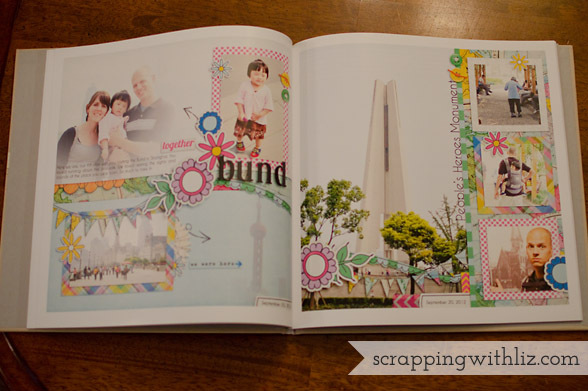 My original plan was to make digital scrapbook pages of our trip to China and her first year home with us and then get them printed in an album. Well, after about 65 pages of just China pictures I just couldn't wait to get them printed. Plus I knew it would probably be a long while before I got through her first year home pictures. I decided it would be good to print our trip to China and then print her first year home in a separate album. AND I was able to have her China album at her 3rd birthday party last week. It was so great to have it there for people to look through....I'm pretty sure I saw a few tears as people read through it. Oh wait, maybe that was just me. I chose to use Blurb for the printing of this album. I've used them before and I thought it was the best, most cost effective option for the 70 pages I was printing. While the pages were super easy to upload and organize I had a little problem with the spine. 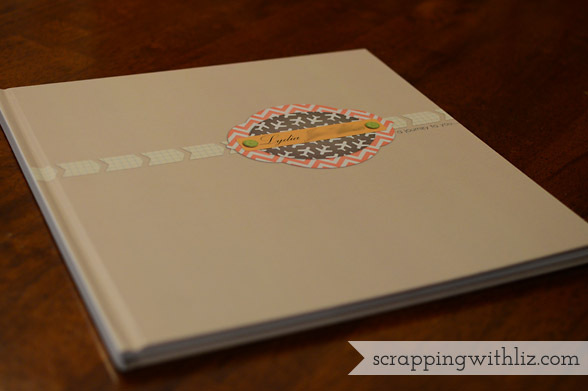 I could not figure out how to get my digital scrapbook paper to go on the spine of the album. So I left the spine white but it kind of blends in with the front cover. I'm sure it was user error as it was late at night and I was tired. I converted this page to a template that you'll see soon! I not only included pics of our trip to China but I included our whole journey to adopt Lydia. This very first page shows the timeline of when we started the adoption process all the way through to the day we came home. I kept note of special events, like her referral, our Letter of Approval and other paperwork that was very important to her adoption process. 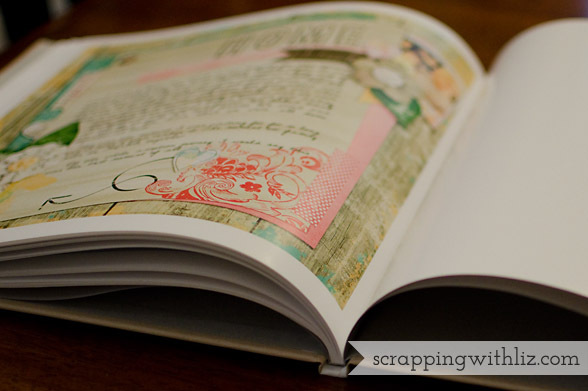 I've scrapped all those, as well as some very personal journaling pages. About 1/3 of the pages in her album are double page spreads like the one above and the one below. The double page above is one of my favorites. I think I like the really big photos and how it seems to all kind of blend together. Right page made with Recyclables 22 by Scrapping with Liz and Leavin' On a Jet Plane by Laura Banasiak and Jenn Barrette. 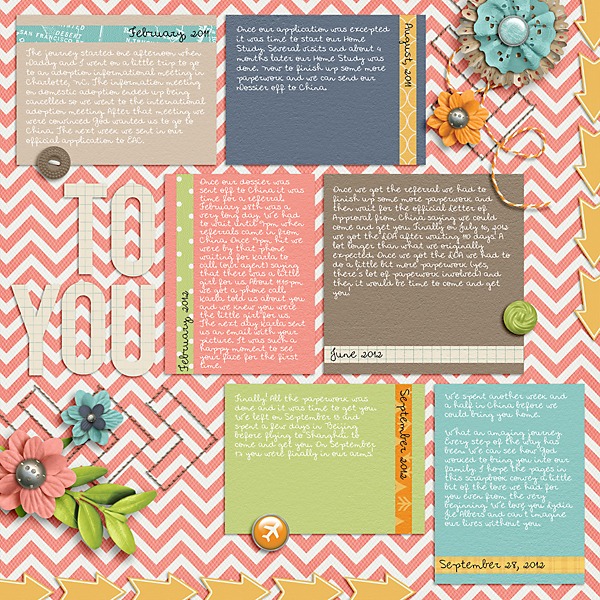 The page above shows what some of the single page layouts look like side by side. I kind of like the contrast. 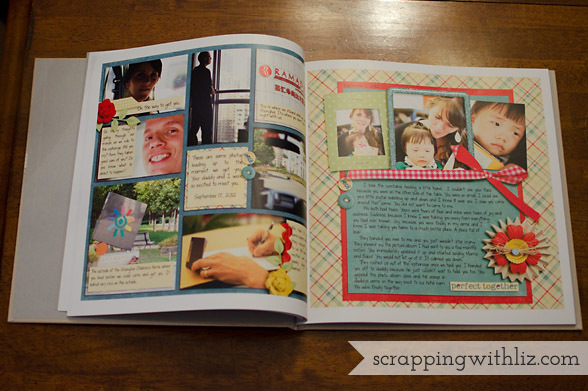 Proof that you don't always have to use double page, matching pages side by side in an album. 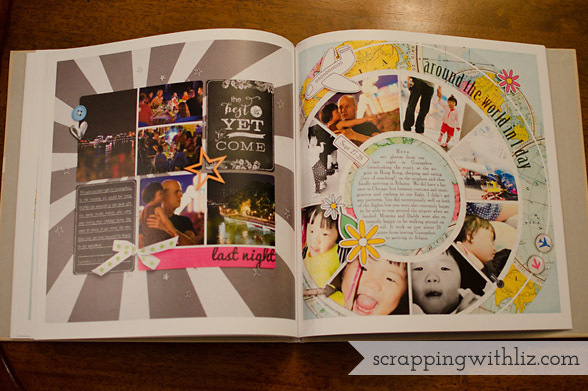 Artsy Journal Templates by Scrapping with Liz and Art and Soul by Tracie Stroud Designs. 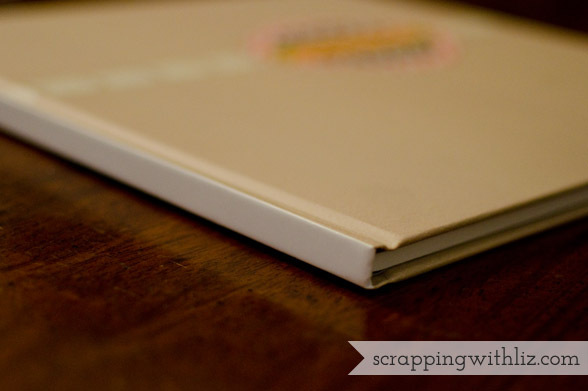 Then this is what the last page looks like, the binding and what the album looks like when opened. I was very happy with my Blurb book, as I was last time. I really love that Lydia has her own, special album sitting on our bookshelf right next to my other girls' baby albums. Now to work on her first year home, finish up our 2012 family album and begin to work on our 2013 family album. Shwew! *This post contains affiliate links. All opinions are 100% my own.